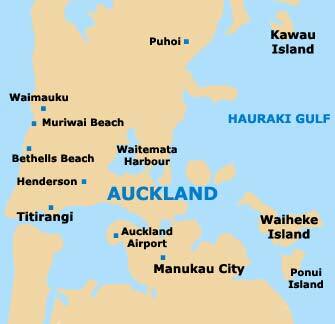 If you are staying in Auckland and fancy playing a round of golf, then you certainly won't be disappointed with the number and variety of courses available to you. Particularly noteworthy is the public course located at Chamberlain Park, while other very worthy opponents include the Formosa Resort, the Gulf Harbour Country Club and the Titirangi Club. 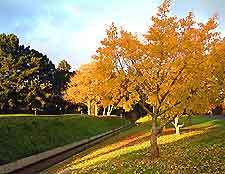 Located on the south-western side of the city and run by the Auckland City Golf Course organisation, Chamberlain Park resides within the suburb of Western Springs and is close to Mount Albert, the Jaggers Bush Reserve, Seddon Fields, Fowlds Park and Point Chevalier. Players can simply turn up here, without the need for tee bookings, and take advantage of the equipment for hire, the onsite pro shop and the friendly coaches. Chamberlain Park is a popular 18-hole public course with excellent golfing facilities, including landscaped fairways surrounded by mature trees, instructors, equipment hire and a well stocked shop. The Grand Golf Park, in the western suburbs of the city, is a picturesque 18-hole course with instructors, a professional shop and stunning views of the surrounding countryside. Located in Western Auckland, other attractions at the Grand Park include equipment hire and inexpensive golfing fees. The Gulf Harbour Golf Country Club, on the north side of the city, is home to a well-designed 18-hole course, with excellent facilities, such as a shop and equipment hire. The Gulf Harbour Country Club is one of New Zealand's premier courses and so booking in advance is always advisable. The Formosa Golf Resort is without doubt one of the North Island's most outstanding resorts, with an impressive 18-hole course, a large sports centre and an exceptional, picturesque setting. Containing large palm trees, more than 70 bunkers and magnificent views of the Hauraki Gulf, the Formosa Resort covers more than 160 hectares / 400 acres. Hauraki Golf Club, in southern Auckland, features a beautiful 18-hole course, with a number of challenging holes, difficult fairways and breathtaking views. Attractions at Hauraki include equipment hire, inexpensive golfing fees and a club house. The Maramarua Golf Club, on the southern outskirts of the city, is within easy driving distance of the centre. With well-designed holes, mature landscaping and affordable golfing fees, Maramarua is one of the most popular 18-hole courses in this part of New Zealand. 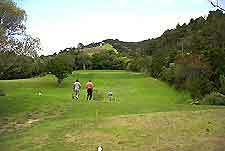 The Remuera Golf Club is an excellent 18-hole course, to the east of the city centre. Featuring good facilities, instructors and a well-stocked professional shop, the Remuera Club is a members only course with fairly expensive fees. Located on the beautiful North Shore, the Takapuna Course is a large public course, suitable for both beginners and experienced players. Takapuna offers equipment hire, practice areas, driving ranges and a superb shop. Titirangi Golf Club is one of the city's most historic courses, dating back to 1920s. Just a 15-minute drive from the city centre, Titirangi is highly regarded throughout New Zealand and this fine 18-hole course always welcomes non-members. The Waitakere Golf Club can be found in west Auckland and is known for being one of the city's most difficult 18-hole courses, with many extremely challenging fairways and obstacles. Attractions at the Waitakere Club include natural beauty spots, equipment hire and inexpensive golfing fees.